Retire to live in park model mobile homes? If you are thinking trailer park, think again. This a great way of living cheaply, whether it be your primary residence or summer or winter home. Before we got our second RV, we visited good friends in Central Oregon every summer. In fact that is where we would be living except for the harsh winters. Our friends, Doug and Judy, have a spacious home set in 6 acres of pine trees. They have since moved to be closer to Seattle, where Mom and other family live. They used to visit family and us in Arizona every March to watch the Seattle Mariners play in spring training. 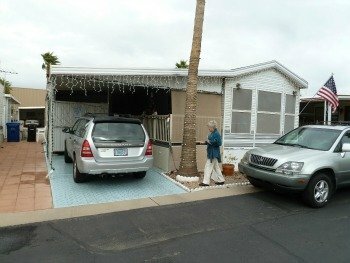 In November 2009, they purchased a park model mobile home in Mesa, Arizona about an hours drive from our home.They now are enjoying a second home, they will spend 4 to 5 months a year in Arizona. This is a picture of the outside of their home, very comfortable, with plenty of room. Man that Lexus looks like it has a lot of miles on it. All done in a very frugal manner, and hopefully this will give you another option to consider for living very well and very cheaply living. They paid $15,000 for a used home, that is no longer mobile, in a huge, 1000 units, park model mobile home village. We, both couples, tore out the carpet, replaced it with a hardwood floor system and repainted the entire unit. For a total of about $500 it is looking great and has opened my eyes to another way to enjoy frugal retirement living. I want to share it with you. It is 40 feet long and 12 feet wide. Giving it about 33% more space than we had on the RV we called home for 7 years. Do not dismiss this as trailer park living. Far from it...the complex they chose (after a lot of research I might add) is well located and has about 10% of its spaces set aside for RV's. The rest are park model mobile home units that are fixed to the ground. Here is what you will find at a typical RV Retirement park. Think you will be bored? I trust them when they say there is more than enough to keep them as busy as they want to be. It is a very active place.There is also a lot of parks to choose from, there are 52 parks in the local area some as large as 2,000 units. Read why Arizona is number one in park model living. The cheapest place to retire? With park models, anyplace you want. As with all frugal retirement living lifestyles, they and their neighbors continually congratulate each other on how well they live on such little money. They are very pleased with their purchase which will afford them an inexpensive second home. About 20% of the residents are "fulltimers" so this is a viable lifestyle for year round living. Think of the reverse situation if you spend winters in a warm location. Buy a park model mobile home in a location with cold winters and spend your summers there. This is exactly what we considered, buying a park model in Oregon, years ago. The unit overlooking the water was 10 years old and priced at $18,000. Please consider living in park model mobile homes as a viable way of living cheaply. We have all been behind one at one time or another. With a pilot car warning us of the wide load ahead of you. They are made up to 45 feet long and most new homes are 12 feet wide. They usually make only one trip in their life, to a park model mobilehome village. There are other options...if you have a tract of land many persons haul such a unit, usually placing the unit atop a concrete slab, and live on their property. The prefab home market is huge, and will continue to grow as more people look for ways for living cheaply. "Double wides" up to 24 feet are available, split in half for transportation. Get a septic tank, drill a well and you are all set if power is available to your land. If it is not, we lived quite nicely on 12 volts with the energy required to charge the batteries provided by solar panels and a wind generator...folks there a lot of ways to skin this cat called frugal living, hopefully our experiences will give you the hope to try this way of life. Here is further info on off the grid living. Where can you enjoy this type of living cheaply? The obvious places to find park model mobile homes is the warm weather sites, with Arizona and Florida leading the way number wise. 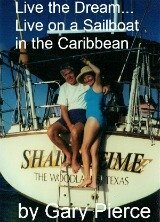 You can enjoy this lifestyle on the water, lake or ocean, or on the beach. There are a growing number of park model mobile home communities in the northern climes, as people are looking for ways to live cheaply and still enjoy their summers or live year round. The park we looked at in Central Oregon had 75% full time residents. So it is just a matter of fitting what you want to do and afford to where you want to do it. In addition to the initial outlay for your unit, you may or may not own the land your unit sits on...much like a condo. Doug and Judy pay a monthly fee (year round of $360 a month), this includes the park upkeep, water, garbage, property taxes, ground maintenance, security,etc. This a pretty much standard deal...The Oregon park we looked at was $350 a month. You will be responsible for your utilities, water and electric, phone (cell phones are by far the option of choice), Cable TV, etc. For more details on basic costs. Add park model mobile home living to your list of options for frugal retirement living. You now have options that float...an option that goes on the road ...and now this option. Think of any great sacrificing to enjoy any of them? Our good friends Doug and Judy, are so busy, with golfing, hiking, bike riding and other activities with their friends at the Park... We see more of them in Oregon in the summer than we do in Arizona... we are only 60 miles apart!! Folks this is doable...you just have to keep an open mind...this flexibility may have you enjoying life more than ever...when your initial driver was how to live frugally. Enjoy! !